Little Havana was an abandoned commercial district in the 1950s. A decade later this blue collar neighborhood became home to many exiled Cuban immigrants following the 1959 Cuban revolution. Now, this Hispanic community has become a vibrant commercial district and tourist destination. The neighborhood has maintained several of its historic homes, including bungalows, Art Deco buildings, and Mission style homes built between the 1920s and the 1960s. 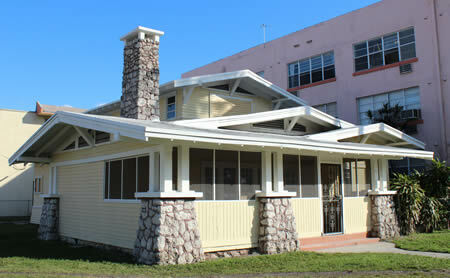 Bungalow home located in Little Havana. Photo courtesy of The Little Havana Guide. City of Miami officials want to bring about more changes to this colorful neighborhood by proposing zoning changes to make way for taller condos and increased commercial development. Some activists are against the city’s proposals, fearing that residents of Little Havana could be displaced. Activists also worry that a majority of the area’s historical buildings could be demolished. Advocates state that a substantial amount of the neighborhood’s housing stock is owned by absentee landlords with little interest in restoring aging properties. Developers and city officials backing the changes argue they would revitalize an economically depressed neighborhood. This entry was posted on Thursday, April 23rd, 2015 at 3:54 pm and is filed under Art Deco, Bungalow, Little Havana, Miami, Neighborhoods, Uncategorized. You can follow any responses to this entry through the RSS 2.0 feed. Both comments and pings are currently closed.